President Bush said today that he would not be “rushed” into deciding on a new course of action in Iraq, and that United States troops would not leave the country “before the job is done” and Iraq is free and stable. He also said he was open to new ideas, including some outlined by the Iraq Study Group, which urged a change of course in Iraq. The president is to spell out a new strategy for Iraq in early January. For today, he was deliberately vague — the better, he said, to keep getting valuable, interesting advice. And while Mr. Bush pledged to work with the new, Democratic-controlled Congress on Iraq, he warned that to leave Iraq precipitously would be to hand that country over to “an enemy that would do us harm,” an enemy whose deadliness was demonstrated on Sept. 11, 2001. So Bush is happily tooling along, Staying The Course and marking time until he can hand the Iraq mess off to his hapless successor, when the Wise Old Men present their Grand Scheme To, Well, If Not Fix Everything, At Least Try To Minimize The Scope Of The Disaster. Bush doesn’t like their grand scheme because it has too much withdrawal and diplomacy, and not enough people getting tortured or blowed up. Bush suddenly realizes that in order to reject their plan, he must actually come up with a plan of his own, which is an idea that never occurred to him even once in the past five years. And so now we get The Big Stall, as Bush pretends to be giving the matter Serious Thought and Weighing All His Options, just like he did before 9/11, when he milked the Moody Prince Stemlet routine for six months. And I can guarantee you that this decision will be just as half-assed and counterproductive as that one was. After all that faux deliberation, Bush will gravely announce that after much prayer and debate and Hard Work, he has reluctantly Decided™… to keep on doing exactly what he’s been doing for the last three years and hope that something different happens, which is so totally not the definition of insanity, OMG I’m so sure. In fact, in a breathtaking Multi Medium Exclusive Scoop, I have managed to obtain a mathematical representation of Bush’s plan. Yes, the ISG plan is mediocre crap with only half an exit. But Bush’s plan will be terrible, disastrous crap with no exit at all. Scientists have discovered an extinct animal the size of a small squirrel that lived in China at least 125 million years ago and soared among the trees. It is the earliest known example of gliding flight by mammals, and the scientists say it shows that mammals experimented with aerial life about the same time birds first took to the skies, perhaps even earlier. 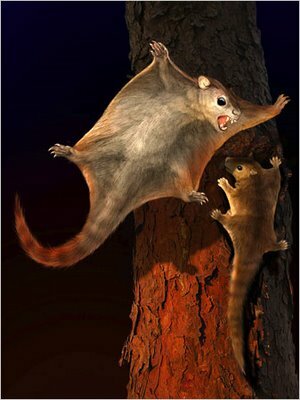 From an analysis of the fossil, the researchers concluded that this gliding mammal was unrelated to the modern flying squirrel and unlike any other animal in the Mesozoic, the period best known for dinosaurs living in the company of small and unprepossessing mammals. They announced today that the species qualified as a member of an entirely new order of mammals. Until now, the earliest identified gliding mammal was a 30-million-year-old extinct rodent. The first known modern bat, which is capable of powered flight, dates to 51 million years ago, but it is assumed that proto-bats were probably gliding much earlier. Archaeopteryx, the earliest known bird, lived about 145 million years ago, though scientists are not sure if it could flap its feathered wings in fully powered flight. But it lived about the time birds did take off in flight. In their study of the fossil, Dr. Meng and his associates noted that the mammal was about half the length of the squirrels frolicking in Central Park, across from the museum. [So… it’s more like a flying gerbil?] The animal had a long, stiff tail that served as a stabilizing rudder for gliding flight. The impressions of fur on the gliding membrane, or patagium, and other parts of its body preserve some of the most ancient examples of mammalian skin covering. Stoopit birds, think they’re so smart with their fancy “feathers,” and “beaks,” and “powered flight.” This’ll sort their bacon. Atman University has challenged its reincarnated students this fall by offering the world’s most advanced graduate degrees. “Students who retain knowledge from past lives can explore subjects with much greater breadth than is possible in an ordinary doctoral program,” said Professor L. Chandra Rao, the university’s Aeternus Chair of Ancient, Early Modern, Modern, and Contemporary American, European, Asian, African, Australian, and Antarctic History. “Students usually require between four and eight lifetimes to receive their diplomas,” Rao said. The school provides an extensive library in which students may find dusty copies of their own writings from former lives. “This helps enormously with the completion of the students’ dissertations, which must be between 2 and 20 million words in length,” Rao said. Atman University also maintains an open policy on transferring credits from past schools. Transcripts on punch cards, clay tablets, and olive leaves from Plato’s Academy were all honored this year. Alas, if I had any former lives, I’m pretty sure they were all useless dumbasses who didn’t witness anything interesting. The Bush administration on Tuesday asked an appeals court to overturn a ruling that could require a redesign of the nation’s currency to help the blind. The appeal seeks to overturn a ruling last month by U.S. District Judge James Robertson, who ordered Treasury to come up with ways for the blind to recognize the different denominations of paper currency. Robertson had ruled in a lawsuit brought by the American Council of the Blind. The council proposed several options for changes, including printing different size bills or changing the texture by adding embossed dots or foil. Jeffrey Lovitky, an attorney for the council, said he planned to petition the appeals court to reject the appeal until Robertson makes a decision on what remedies the government should pursue. A hearing to hear the government’s recommendations is scheduled for next month. Christopher Gray, president of the council, said that while his group has been lobbying for changes to help the blind since 1995, the government has yet to conduct any feasibility studies of what those changes might cost. He said that during that time, the Bureau of Engraving and Printing has made several design changes to thwart counterfeiters. In his ruling, Robertson said that of 180 countries issuing paper currency, only the United States prints bills that are identical in size and color in all their denominations. He said the current practice violates the Rehabilitation Act, a law that prohibits discrimination on the basis of disability in government programs. In the government’s appeal, Justice Department lawyers argued that visually impaired people are not denied ”meaningful access” to money by the way the nation’s currency is designed. They noted the existence of portable reading devices that the blind can use to determine the denomination of paper money. The government said the blind can also use credit cards instead of currency. The government also argued that Robertson was wrong in ruling that making changes to help the blind would not be unduly burdensome. She said there are 1.3 million people in the United States who are legally blind and there will be millions more in coming years as the baby boom generation ages and more people fall victim to macular degeneration and other diseases that can affect vision such as diabetes. ”While the government may argue that changing the dollar bill will cost billions, it will pale in comparison to the costs of the vision loss epidemic,” Cortes said. The bolded paragraph in particular has kind of a let-them-eat-cake ring to it in my ears. Yet another stirring example of compassionate conservatism in action, as well as Bush’s aforementioned personal fondness for the disabled.